Here it is. My third Clapotis. 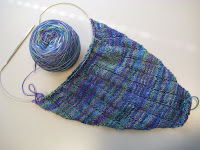 I have nearly completed the increase rows, and am really getting into the pattern. Again. But it does beg the question. How many Clapotis does a girl REALLY* need?? Ambitious much? Maybe. BUT I am meeting up with some crafty chicas, so I will have the support I need to meet this mighty challenge! * That is a REAL need as opposed to a BURNING desire! Oh you can totally do that! But maybe you should leave the casting on of the gloves until you've done the other two - your reward! Of course you NEED more clappys! You can't be expected to wear the same colour one with everything, or the same weight one all year. Nothing like a check list to keep you focussed. And guess what? I knitted me a sock! A little baby one in 8 ply (thanks for the suggestion! ), but its a whole sock! Are you a Stole or Shawl? I Present to You, The Clapotis!